When Barrister Jean de Dieu Momo went from being an unknown lawyer to a cabinet minister in the Biya Francophone Beti Ewondo regime, there was no natural urge to know more about him. He was simply a pro Biya comedian. Now he has provided not only local but the international media plenty to go through. 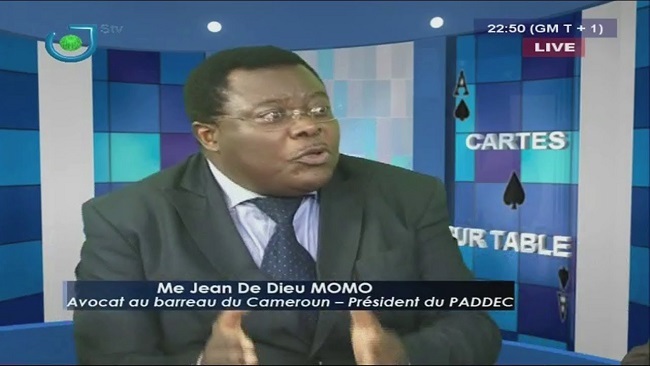 Ever since he was installed as a Cameroon government minister by Prime Minister Dion Ngute, Jean de Dieu Momo has been the kind of French Cameroun politician from the West region who shows up everywhere seeking for notice and stays late in television stations to protect the already battered image of the Biya regime. Questioned recently on the Cameroon Radio and Television (CRTV) on why he thought his kinsman and opposition leader Prof Maurice Kamto had blatantly refused to accept defeat following the October 7th presidential election, the so-called Francophone cabinet minister used long established anti-Semitic stereotypes. He noted authoritatively that “In Germany, there was a race of very rich people. They had enormous economic power. And they were so arrogant that the German people felt a little nervous. Then one day, a certain Hitler came to power and put these populations in gas chambers.” These are the kind of evil men that the 85 year old Biya relies on for his political survival and relevance in a country that is crumbling at catastrophic rapidity. 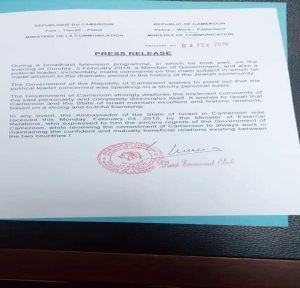 Correspondingly, the Israeli Embassy in Cameroon has said it is outraged at comments made by Cameroon’s Deputy Justice Minister Jean de Dieu Momo in which he justified the Holocaust that some six million Jewish people were killed in Nazi Germany. It is vital to understand that Prof Maurice Kamto, the leader of the MRC party, comes from the Bamelike ethnic group who have a reputation for being successful businessmen and women. Minister Momo, who is also an ethnic Bamelike, further opined that it would be wrong for the group to seek political power alongside their economic influence, and suggested that trying to do so could be dangerous for the entire community. The Israeli Embassy in Cameroon noted in a statement that “the government official has justified the Holocaust perpetrated by Nazi Germany”. It went on to suggest the comments would have an impact on the two countries’ relationship. The embassy called for “an immediate apology,” from Cameroon’s government and they have gotten one. But nobody in Yaoundé even from within the ruling CPDM crime syndicate had really paid attention to Minister Momo after his anti Semitic comments, because why would you? He simply sounded a note of caution to his Bamileke community not to dare challenge Biya like the people of Southern Cameroons. It is now evidently clear that the Biya regime is run by a gang of Holocaust deniers who only need the Jewish state for interest-free loans and weapons including political protection. The Biya regime’s war in Southern Cameroons-Ambazonia is being waged using Hamas and Hezbollah tactics-groups that continue to pose serious danger to the state of Israel. President Biya’s most trusted pilot for more than three decades has been a Palestinian national. With the Biya Francophone Beti Ewondo regime perilously weakened by Boko Haram and the war in Southern Cameroons, Holocaust deniers like Ministers Momo, Paul Atanga Nji and Ferdinand Ngoh Ngoh are closer than ever to becoming Cameroon’s Chief executive. There is a fear, a real fear of this disturbing development in the Cameroon political story. This is not a low attack on the Yaounde government. Tribalism and nepotism have been the organizing principles of the Biya regime and the 85 year old leader has allowed prejudice to go unchecked ever since he took office in 1982. Yaoundé’s attempt to respond to the Minister Momo issue has somehow managed to make things worse.